Sonic Blast was one of the more ambitious outings for the blue blur when it initially released on the Game Gear. Though a handful of other titles such as Donkey Kong Land previously attempted to bring pre-rendered visuals to underpowered portable handhelds, Blast did so with actual color at its disposal. Aspect and Sega deserve some credit for attempting to add a twist to the comparatively routine aesthetics of Sonic’s other outings on the handheld. Playing the title on the 3DS today, however, only reveals the general lack of polish that was perhaps defensible in 1996. The pixelated sheen given off by pseudo-3D Sonic and his world is not particularly dazzling and much less so on the expanded screen of a 3DS (never mind the XL model). Even tapping into the Virtual Console functions to restore the game’s native resolution reveals the artistic design is decidedly dated. While not game-ruining and certainly not as poor as some have claimed, the game in motion often looks and feels disconcerting. Why are the visuals so relevant to the formula of a standard 2D Sonic platformer? To be blunt, it’s because they severely hamper the fluidity of the game. Slowdown constantly plagues Sonic as he somehow manages to dash slowly and trot through the air with nonchalance. Even if the game actually ran at an acceptable speed, the effects are such that they detract from the core experience. The style also prevents series standard functions such as a timer from being displayed on the screen due to the strain on system resources. This previously played a role, however limited at times, in providing replay value to the series. Perhaps the timer’s absence is more noticeable because of the spotty level design. One particular stage has players navigating an underwater maze with obtuse, pixel-perfect routes that will no doubt drain more lives than the straightforward levels. The stage also provides plenty of oxygen so players feel at ease until they shift back into reality as the game claims they’re approaching the ten minute mark. With that in mind, were you to convert Sonic Blast into the engine of one of the other Game Gear games, its shortcomings would still be prevalent. The subpar design and faintly lacklustre soundtrack would simply be that much more overt rather than masked by the graphical grandeur (if one can call it that with a straight face). 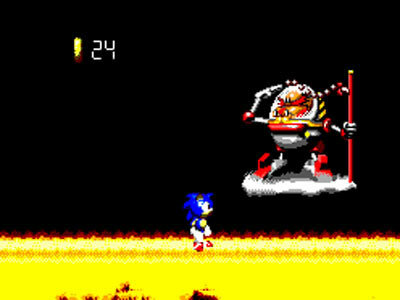 In all fairness, Sonic Blast does have its moments of fulfilment. For instance, the first few zones contain a decent (albeit stunted) sense of speed and offer an incentive to explore given their surprising brevity. 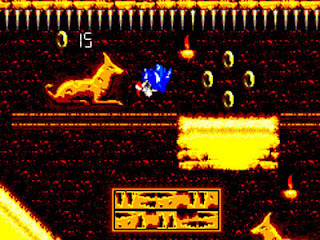 The double jump mechanic, though scarcely used in future entries, serves as solid means of extending the scope of Sonic’s exploration and offers protection from the occasional slapdash section. Had this been implemented in all of Aspect’s Sonic Game Gear games, they certainly would have been more playable regardless of the slapdash design crutch. The inclusion of Knuckles as a playable character also livens things up somewhat for those actually inclined to play through the game more than once. Sonic Blast is perhaps not the notorious abomination some have trumpeted it as, but the eShop offers so many superior platformers – hedgehog-related or otherwise – that downloading its insipid self is unwarranted. Item Reviewed: Review: Sonic Blast (3DS) 9 out of 10 based on 10 ratings. 9 user reviews.